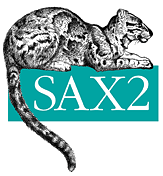 SAX is the Simple API for XML, a de facto standard. I first used SAX a decade ago in C and I've used it in Java and Python many times. The SAX parser works by offering a number of interfaces you implement and pass to the generic parser for it to use. The SAX parser is an event-driven algorithm for parsing XML documents. It's an alternative to the parsing style provided by the Document Object Model (DOM). I first used it in C circa 2008, and much more recently in Python and Java. Note in passing that SAX requires the smallest possible amount of memory (especially as compared to DOM) in accomplishing its work. It's generally faster. You can build as much structure as you like, on your own, and in the way you like because of SAX' event-driven nature and how it keeps little-to-no state around. It is possible to use it on streaming XML documents: you do not have to have the whole enchilada in memory. This is another benefit. Think of SAX as going down a staircase with one hand on the rail: only what's under your hand is what's in memory. The essence of parsing using SAX is given in the following methods, startDocument, endDocument, but especially, startElement, endElement and characters. startElement(), called when an element (tag) is encountered, <element ...>, gives you the element and a list of all (any) attributes, allows you to erect element state, probably on a stack. endElement(), called when element's end is reached, </element>. There may have been intervening elements, so your element's state is on a stack and would get popped off at this point. characters(), called to give text between element's beginning and end. You must be prepared to accumulate these across multiple calls because it may be called more than one time. startDocument(), called at beginning of XML document, allows you to set up document state. endDocument(), called at end of document. Create your handler thus with, at first, the five methods listed above. Of course, you'll have to satisfy the DefaultHandler contract by implmenting (at least stubs for) all the methods. This example rudimentarily prints out what the SAX parser sees if you run the parser on an XML file. Now create your application's main entry point, set up the parser to consume your handler, then call it (the highlighted line below). We'll pass the sample XML filename as the argument. Tells you this stuff; you get an instance of this, via the method, pretty much before anything else and the parser maintains the line number and column throughout its parsing. Very useful for error reporting in XML validation and other activities. Here's the comparison table. LexicalHandler adds, for example, special methods to allow you to handle XML comments, which are otherwise completely ignored (you won't ever be notified about them), as well as CDATA, DTDs, etc. I first wrote up these comparisons in an effort to understand why, in some code I was reading, ContentHandler was being used instead of DefaultHandler. Then I realized that it was because the original author did not want to handle errors. ...at your disposal with terse comments on what they do. I have not myself done everything possible with SAX and there's much I don't know. * observations about CDA and CCD documents. * find a way to disembowel the document to get content out. * Just output to the console whatever's found. * @param outputFilepath to which results will go. * @param hush shut the console up (no output to console). * processing for the next document (as opposed to a previous one). * that's been processing and is finished. * intercepted and used for analysis. * we know the tag is finished and what we've got in characters is its content. * —what gathers the plain text content between the opening and closing tags. * also having plain text. * @param ch     array holding the characters. * @param start  starting position in the array. * @param length number of characters to use from the array. * with a DTD. If the parsed XML file doesn't preconize a DTD, it won't happen. * "<! [CDATA[<p>The pug snoring on the couch next to me is <em>extremely</em> cute</p>]]>"
* Reports any and all XML comments anywhere in (internal) document. * @param ch     array holding the characters in the comment. This example parses XML from a string (see XmlSchemaTest.java), but it could be a file as shown in the earlier Java samples. The goal is to create an instance of XmlElement that recursively contains the rest of (the XML content whether in a string or a file). Among other things, this exercise demonstrates how to use stacks to keep track of where one is to gather text out of intermingled subelements for the owning element. This test ensures (visually-only; no assertions are made, so these are not real test cases) that our parser can do a couple of levels deep and a couple abroad for the purpose of demonstrating the idea only. *   This is a test. final String   XML_CONTENT = "<?xml version=\"1.0\"?>\n"
+ "  This is a test.\n"
+ "<document attribute=\"fun and games\">\n"
+ "  <subdocument another=\"more fun and games\">\n"
+ "  <subdocument1 another=\"more fun and games\">\n"
+ "  <subdocument2 another=\"still more fun and games\">\n"
This is the brass ring at the end of the run. The entire XML content, as a tree, is in this object (and recursive instances below it). Works in concert with internal class ContentBuffer to gather element text. This is necessary because underneath a given element there is text, but XML says nothing against more XML elements tossed among the text though this is inelegant. We keep the elements in a stack as we encounter them in order to know where to go to attach the element text we don't finish gathering until much later. This is where the heavy lifting is done. As described elsewhere on this page, SAX calls this handler at key points in the parsing process. This is excerpted from a parser in a servlet used to process in-coming requests in XML. The guts of what to do with the parsed XML aren't shown, but just where that happens. * Set up an instance of a SAX parser with handler initialized to zilch. * @param state used by the handler. * @throws Exception should any error occur. * Parse the in-coming data. * @param in in-coming data as a stream. In order to do something cogent with what's parsed, this is the stack that keeps the data together and useful. * - text content associated with the element, if any. * get it), then add the content to the buffer. * @param content to append to what's there. Because this is reentrant code, potentially called by many threads, this is the state instantiated separately for each. There's some debugging aids kept, but mostly it's just a stack of information that's filled out as the SAX parsing proceeds. Here's the meat of the parser. It's in method endElement() that the data parsed will be used to call code that does something with the data. * @param uri namespace URI, where the prefix is from; we ignore this. * @param elementName (SAX calls this the qname; it's both the namespace prefix and local name. * @param attributes any attributes on the elementName. * —what gathers the plain, text content between the opening and closing tags. * @param ch     array holding the contentStack. * @param length number of contentStack to use from the array. * we know the tag is finished and what we've got in character content. * Gather text content from SAX. * @return content bereft of multiple newlines from end leaving at most one. // debugging: bump line count by number of newlines"
Here's how to set up the parser and call it with some data. SAX chokes on stuff like &lt; and &gt; so if your XML has embedded HTML (it happens to me in the medical documents I deal with), you can delimit the HTML and pass it off to a subparser written using TagSoup. Meanwhile, here's how easy it is to set up and use TagSoup in a very simple example. The highlighted lines are supposed to draw your attention to the important SAX or TagSoup bits of the code. A version of calling the parser with string- rather than file input is provided for gee whiz value. Copyright ©2010 by Russell Bateman and Etretat Logiciels, LLC.